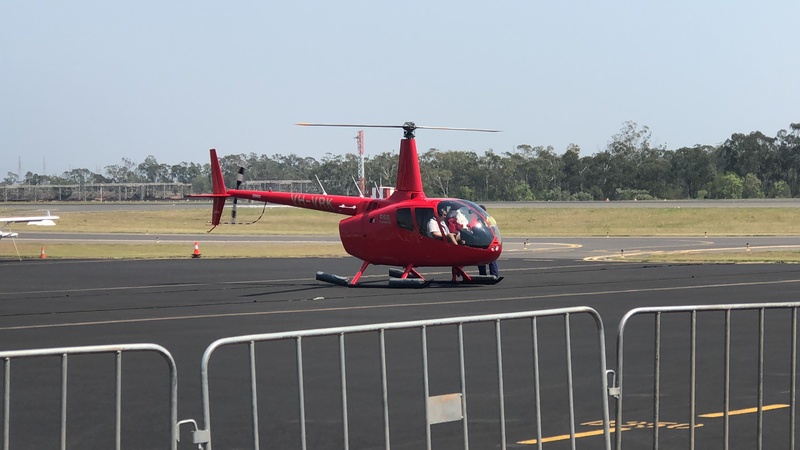 Santa chose a helicopter over his sleigh on Sunday when he flew into Gladstone Airport to share some Christmas cheer. There were smiles galore from the cheering crowd as Santa and his elf joined the excited families from Roseberry Qld, along with members of the airport community. “This is the second year we have held this event,” Airport Chief Executive Officer, Colin Fort said. “The airport community has come together to give our guests a close-up look at the airport fire trucks as well as some privately-owned aircraft. It has been a trying week for Gladstone emergency services. Our thoughts go out to everyone who has been involved in managing the situation in and around Gladstone. We live in a fantastic community where everyone pulls together when they need to. That’s really what’s behind us holding this event, which is about giving a unique Christmas experience to some families who are doing it a bit tough,” Colin explained. Colin welcomed the crowd to the airport and thanked everyone who had worked together to put on the event, including Alliance Airlines who donated return flights for four to Brisbane for a prize drawn from the Roseberry Qld guests in attendance. “Our locally based Marine Helicopter service got the call to transport Santa and his helper today, and they were more than happy to oblige. We are also really grateful to RFDS, who were able to provide us with use of their hangar today to hold the event,” Colin continued. The Rotary Club of Gladstone cooked up a storm, while eager children had their faces painted, ate ice cream and received a gift bag from Santa, before heading home from a truly memorable celebration.